In June, Manchester Grange brought to us, their program “The Movies”, complete with popcorn to munch on during the presentation. We enjoyed a fun program and great company. On the 25th we took our program “Looking in The Rearview Mirror” to Manchester Grange. As always, we had a nice evening visiting there. 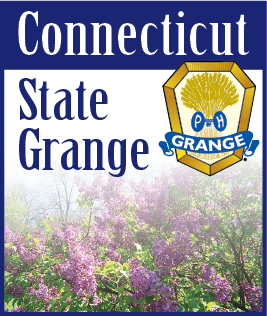 We enjoy exchanging programs and encourage your Grange to try it! In July, our topic was be “Freedom!” . On July 10th, we had a booth set up at Rockville’s July in the Skies Celebration. We distributed free hearing protection to help conserve hearing during the fireworks. August brings our annual potluck picnic, held at the Strong Farm, weather permitting. We will be writing postcards gathered from our summer vacation trips, to send to military personnel to thank them for their service that allows us the freedom to travel. We will start our Grange year with a look at Grange history. October brings Grocery Bingo. Many of us are planning on taking the 6th degree on October 18 at State Session. On Craft Night we will begin to make holiday decorations for a local nursing home. We welcome visitors, please feel free to come to our meetings.